The bar at the Treasury. Photo: Tory Putnam. 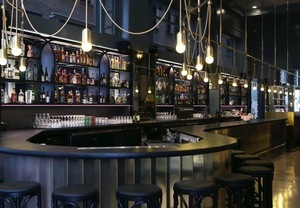 Another look at the bar. Photo: Tory Putnam. There’s a new watering hole in the Financial District, ~THE TREASURY~, which opened in the same historic Beaux arts building as Blue Bottle Coffee on Sansome. 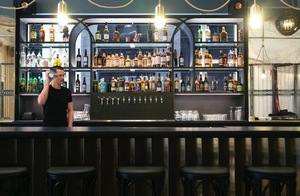 The spacious bar is from former Bacar vets Arnold Eric Wong (E&O), bartender Carlos Yturria (Lure + Till, Claude Lane, Absinthe), and Phil West (Range, Third Rail), and partner Steven Werney of Teutonic Construction (Twenty Five Lusk). Bar director-partner Yturria’s list of craft cocktails is meant to be fun, but quality, with drinks like the Shark Tank (Cutty Sark 108 Scotch whisky, huckleberry and coconut shrub, absinthe, lemon), Giggle Water (Christian Drouin Calvados, housemade quince preserves, bubbles, lemon), and Oro Viejo (Partida añejo tequila, pecan and oloroso sherry reduction, St. George absinthe, Dale’s DeGroff’s pimento bitters). Sherry lovers will find 20 selections by the glass, plus beer and wine. You also won’t go hungry, with bar bites like chicken liver mousse, seafood like oysters and a crab roll, and pigs in a blanket with gourmet sausage. Take a look at the menu here. Geremia Design (Hogwash, Coffee Bar, Churchill) is behind the interior, with double-height ceilings, leather seating, marble tables, and a massive bar, with a folded facade of brass metal and black—it’s a bit Paris bistro, with some Victorian touches too. Open Mon-Wed 3pm-12am, Thu-Fri 3pm-2am, and Sat 5pm-2am. 115 Sansome St. at Bush. A variety of places to sit and enjoy a glass at High Treason. Photo courtesy of High Treason. 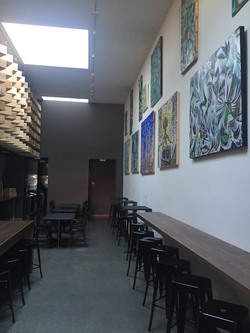 Local art is a part of the décor at High Treason. Photo courtesy of High Treason. 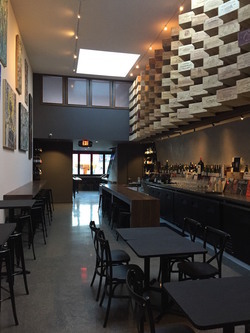 After months of delays (you know how it goes), Michael Ireland (previously a sommelier at The French Laundry, Quince, Benu, The Restaurant at Meadowood) and John Vuong (Ame, Gary Danko) have finally been able to open the doors to their wine bar and retail shop in the Inner Richmond. The list isn’t pigeonholed to a particular style, although they are saying away from big brands and about a third of it will be from California. There will also be French, Italian, Spanish, German, Austrian, and Slovenian wines in the mix. As for the food, look for this part of the offering to ramp up—they’re still in soft opening mode right now (the grand opening is scheduled for Saturday February 13th). Their consulting chef is Danny Brooks, who is developing the menu—think small plates to start (cheese, charcuterie, croquettes, french fries in duck fat), and then more involved dishes in time. There are 47 seats, with a bar, tables, and high-tops, plus a private dining room upstairs for dinner, education, and tastings. A big part of their concept is to be able to offer multicourse dinners a couple of times a month centered around the wines (instead of vice versa). They’re having fun playing vinyl on their turntable—look for some somms who also spin to drop by. Hours for now are Mon-Sat 5pm-9pm, but after Sat, they will be open Mon-Fri at 4:30pm and Sat-Sun at 11:30am. They’ll close at 10pm Sun-Thu and at 11pm Fri-Sat. 443 Clement St. at 5th Ave., 415-555-1212. Photo courtesy of Flatiron Wines & Spirits SF. We told you about the New York wine shop coming to SF, ~FLATIRON WINES~, and they are now open in The Palace Hotel in the former Kyo-ya sushi restaurant. 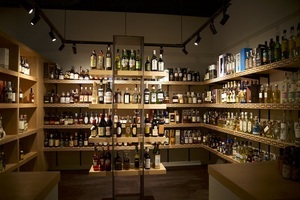 Look for boutique wines, international selections, spirits, and more, with triple the selection of the New York shop. You’ll find extensive collections from Burgundy, the Loire, the Northern Rhone, Piedmont, Germany, and Champagne, and quite a selection of small-production California wines. Boor Bridges Architecture designed the spacious 3,500-square-foot space, which has custom, handcrafted shelving. You’ll find a private event room and a tasting area where customers can sample wines (you can also order food in from the Palace). Look for upcoming free tastings, educational seminars, meet-the-winemaker opportunities, book signings, and other wine-related events. Open Mon-Sat 9am-9pm, Sun 12pm-7pm. 2 New Montgomery St. at Market, 415-780-1405.